The Massachusetts Department of Transportation is convening public hearings on toll structure changes within the Massachusetts Turnpike, and the Metropolitan Highway System, which includes the Boston tunnels and the Tobin Memorial Bridge. The proposed changes include changes in the toll collection gantry locations and rates through the implementation of all electronic tolling along the Massachusetts Turnpike and the Metropolitan Highway System. Public hearings will be held on the dates and at the locations stated in this notice. Interested parties will be given an opportunity to present comments orally or in writing at the hearings. In addition, written comments will be accepted for 2 weeks following the hearings, until 5:00 p.m. on Thursday, September 29, 2016. One of the public hearings will be held at 6:30 p.m. on Wednesday, September 14th at the Springfield City Hall, 36 Court St., Springfield, MA 01103. For further information on the public hearings please see the following flyer. Fall is a great time to get outside and spend time in your yard and gardens. The Greenscape Challenge can help you to decide what projects to focus on which can improve your yard and gardens and help protect water quality at the same time! The Greenscape Challenge, part of a collaborative project between the Town of Greenfield, the FRCOG and Greening Greenfield, is aimed at teaching you about various projects and techniques you can use in your yard and gardens to help reduce stormwater runoff from your property. Stormwater runoff can often carry with it lawn chemicals, motor oil, dog poop, grass clipping and much more, which in turn wash into storm drains and on into our streams and rivers. Take the Greenscape Challenge and join the growing numbers of people working to protect water quality in Greenfield and beyond. Learn more. The Franklin and Hampshire County Regional Emergency Planning Committees will jointly sponsor a full scale hazmat exercise in Hatfield on September 17. Meet members of the District IV HazMat Team, practice sizing up a hazmat incident, operating under unified command, and communicating across county lines. For more information, or to register, click here. 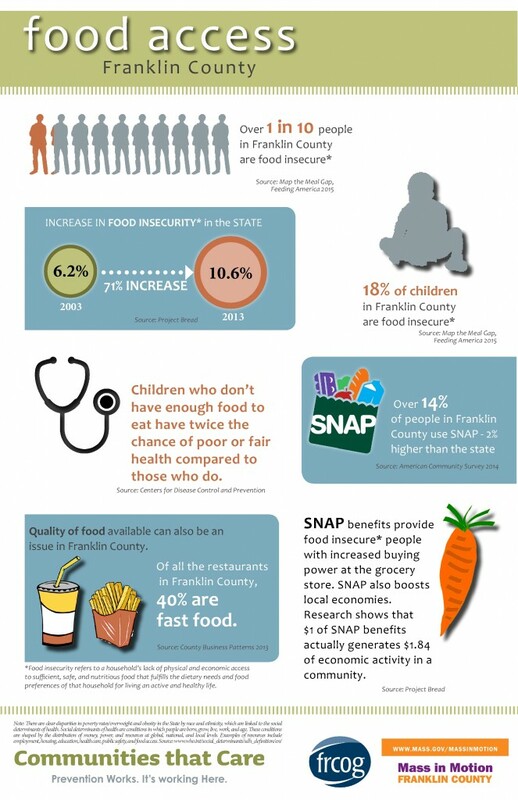 New infographics illustrate the links between income, food access, diet, activity and health and focus primarily on Franklin County data. Funding for the development of these infographics was made available by Mass in Motion. The complete set of infographics is available here. This infographic highlights the link between lack of good access to food and public health. Kinder Morgan-TGP NED Gas Pipeline Project Overview: The proposed Kinder Morgan Tennessee/ Gas Company pipeline would have been a new natural gas pipeline that would have directly impacted eight communities in Franklin County. It was proposed to be generally co-located along high voltage electric transmission lines and was approximately 34 miles in length. A large-scale compressor station associated with the pipeline was proposed to be located in Northfield. If it had been approved by the Federal Energy Regulatory Commission (FERC), it would have been the largest infrastructure project since the construction of Interstate 91 in Franklin County. On April 22, 2016 Tennessee Gas Pipeline (TGP) Company suspended further work on the NED pipeline and requested that FERC take no further action. On May 11, 2016 the FRCOG submitted a letter to FERC requesting that FERC deny or dismiss with prejudice the Application for the KM-TGP NED Pipeline. On May 23, 2016, KM-TGP formally withdrew its Application to FERC. The FRCOG plans to send a follow-up letter to our Federal Legislators with recommendations to improve the FERC process. For more information contact Linda Dunlavy at lindad@frcog.org or Peggy Sloan at psloan@frcog.org. The goal of the Greenscape Challenge is to provide Greenfield residents and others with clear steps they can take with their lawns, gardens and other outdoor spaces to improve the water quality of our streams and rivers, and the environment in general. Participants of the Greenscape Challenge can download the Greenscape Challenge Toolkit that provides information on planting trees, building rain gardens, disposing of household hazardous waste and dog poop, and reducing or eliminating chemical use on lawns and gardens. All these actions and many more can help improve water quality in our rivers and streams. 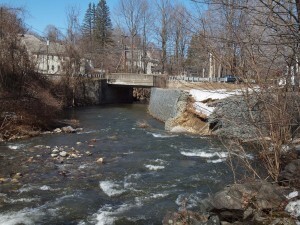 The Greenscape Challenge, part of the Town of Greenfield’s Low Impact Development project, is a collaboration between the Town of Greenfield, Greening Greenfield and the Franklin Regional Council of Governments and is funded in part by a MassDEP s.319 grant and a Massachusetts Environmental Trust (MET) grant. For more information, contact Mary Chicoine at maryc@frcog.org or 413 774 3167 x 131. Take the Greenscape Challenge now! History tells the story of prosperous Franklin County towns settled along rivers. Residents used the rivers as a source of food, water, transportation and power. The benefits of the rivers far exceeded the risk of damage to homes and businesses from floods. People erected dams to power mills, and straightened and channelized rivers to accommodate homes, agriculture and businesses. Fast forward to the present time and flood damages are the legacy of historic manipulations of the river and current efforts to repair flood damage. A failed retaining wall along the South River in Conway demonstrates the sometimes destructive power of a river. Flooding is the most common natural hazard in Massachusetts. 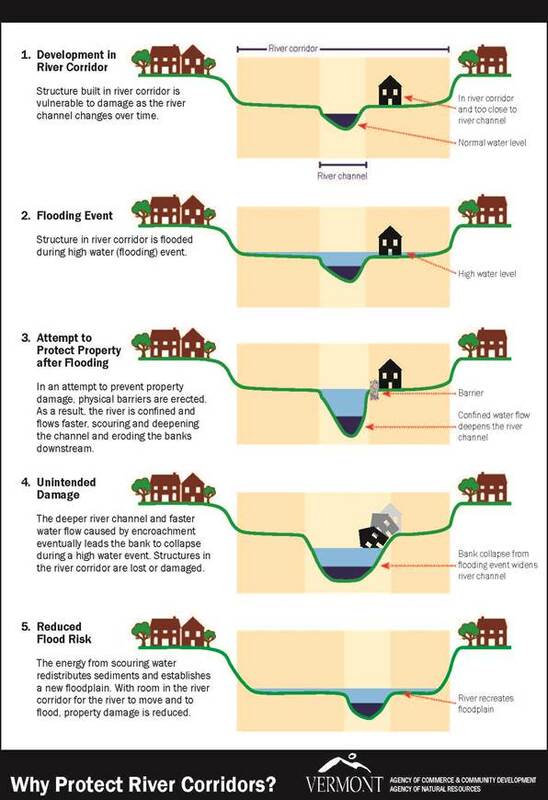 Flood damages occur due to rising rivers that cover land with water and fluvial (river-related) erosion. The common response to flood damage has been to try and manage the river by dredging, armoring the banks with riprap, constructing berms, and straightening the river channel. This approach, while well intentioned, is not sustainable and has led instead to an escalating cycle of increasing flood damages and costly repairs. Each of our towns can easily point to numerous roads, culverts, bridges and/or retaining walls along a river that have failed numerous times. Floods are inevitable so what is a sustainable, cost-effective river management option to reduce flood losses for our towns? Avoidance: limiting new development in the river corridor. This approach allows room for the river to change its flow, width and depth over time, which reduces flood damages to structures, fluvial erosion losses and habitat degradation. Strategies for protecting existing homes, roads and other infrastructure will continue to include bank armoring and river restoration projects. Preserving the river’s floodplain functions and limiting new development in the river corridor will help to protect existing at risk structures, too. What does the river corridor look like? A river corridor is more than a fixed setback from the river, like the 200 foot setback regulated under the Rivers Protection Act. A river corridor can be wider or narrower than the 100-year floodplain boundary. A river corridor includes the river, its banks and the land close to the river that carries flood waters and accommodates the meander pattern or movement of the river. Science-based; considers the entire watershed and river processes, including fluvial erosion. Focuses on sensitive areas – those that are most vulnerable to human and natural stressors. Encourages identification of future problem areas. Enables protection of infrastructure and habitat. Now that the river corridor is mapped, what are some tools towns can use to implement an Avoidance Strategy? One tool developed by FRCOG is a draft model River Corridor Protection Overlay District Zoning Bylaw. The degree of protection provided by a River Corridor Protection Overlay District depends upon the needs of the individual town, but could include limits on new structures, prohibition of certain land use activities, or limits on the amount of vegetation that can be removed for new development or limits on the amount of new impervious surfaces (think asphalt). Over time, this option will do the best job of minimizing human/river conflicts. 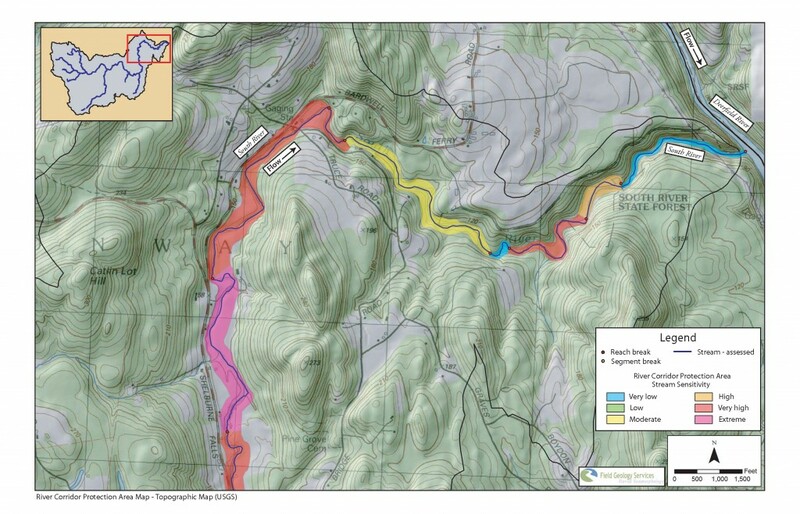 This project for the South River Watershed was the first application of the VT ANR river corridor mapping protocols in Massachusetts. With future funding, FRCOG hopes to map more river corridors in Franklin County and develop other innovative tools for protecting these important resource areas and adjacent infrastructure. For further information about the project, please contact: Kimberly Noake MacPhee, P.G., Land Use & Natural Resources Program Manager at kmacphee@frcog.org or 413.774.3167 x130. FACT = People struck by lightning DO NOT carry a charge. It is safe to touch a lightning strike victim. In fact, giving first aid to lightning strike victims can save their lives.